1st - A spun hub inside of the propeller. Sometimes the hub will slip inside of the propeller at higher rpm's. The quickest way to check a bad hub is to try another propeller to see if it slips at the same rpm's or you can try putting a dab of paint on the hub and a dab on the prop and try it to see if the 2 marks still lineup after a trial run. If the hub has spun, you will have to take it to a prop shop for a hub replacement. This can cost between $50.00 to $75.00 and some prop shops will not guarantee the new hub to hold. 2nd - The incorrect propeller thrust washer. 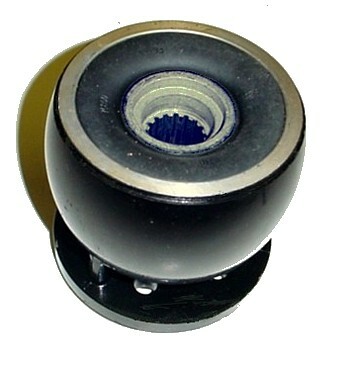 The propeller thrust washer must match the type of propeller being using. To thick of a washer on a Black Max Prop will not allow the propeller to go deep enough to seal the escaping exhaust gas. The gasses will come out around the propeller instead of going thru the prop causing cavitation. The engines revs up at a certain rpm and slips just like a spun prop hub. Make sure the propeller enters the lower gear housing by at lease a 1/4 of an inch after being torqued down to 50 foot pounds. 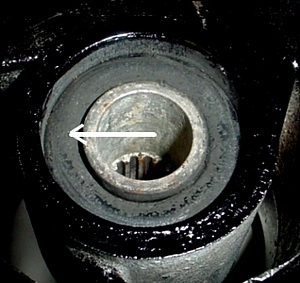 3rd - A worn outdrive housing rear inside diameter or outside prop diameter. 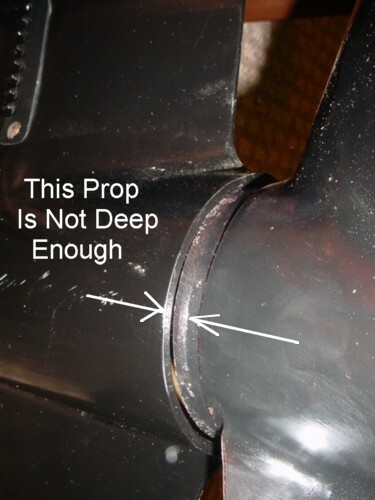 If the prop is going a 1/4 of an inch into the lower housing and you still have the same problem, it could be the inside diameter of the lower outdrive housing or outside diameter of the propeller has worn due to getting an anchor rope or something wedged in between the 2 diameters. A new housing is 4.400 dia. and a new prop is 4.350 dia. 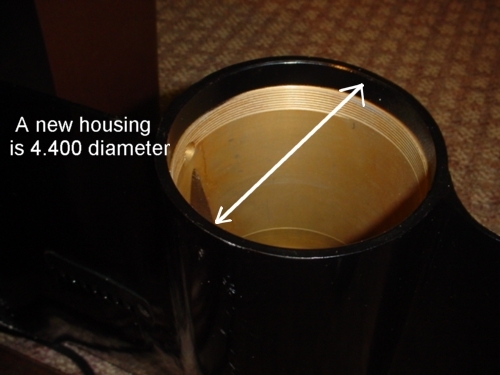 which means there is suppose to be only .025 clearance on each side of the 2 diameters. If this clearance gets to be to great, again the exhaust gasses will come out around the propeller causing slippage. 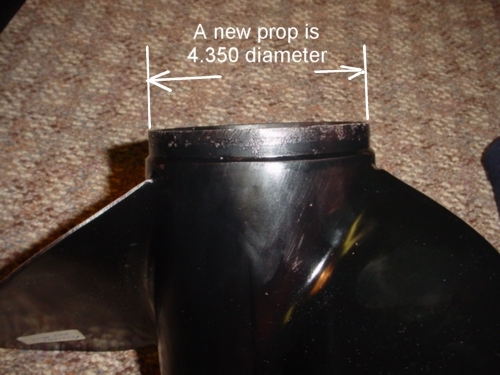 Try another propeller with a larger diameter to see if it slips at exactly the same rpm. 4th - A spun engine coupler. If the propeller appears to be ok and your still having the same problem, it could be the coupler at the back of the engine. Generally speaking, if the rubber hub inside of the engine coupler slips, you should be able to smell burning rubber at the rear of the boat. If the boat is in the water and you have someone with you, you can have them look behind the engine to see if the driveshaft coming out of the coupler going to the outdrive has the same rpm when the slippage occurs. If the engine rpm increase but they see the driveshaft rpm decrease, the coupler is bad. Sometimes the engine will even start to overheat because the water pump in the outdrive is not turning fast enough to cool the engine. To replace an engine coupler, the outdrive must be removed and the engine has to be lifted high enough to turn it around inside of the boat to replace the coupler.